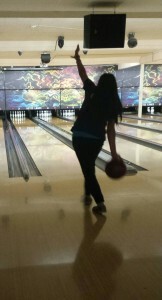 This year, Olympia High School added bowling to its wide range of athletics. The OHS bowling team welcomed all female students and more than 50 girls were eager to test their abilities on the first day of practice. OHS bowling team member Justina Dizon aims for a strike during a non-team practice session at Aztec Lanes. The OHS bowling family has many talented members and many opportunities for success. The bowling averages are changing constantly. This makes it possible for junior varsity and c-team bowlers to move up. The fact that everyone has an opportunity to advance throughout the whole season motivates students to show up to practice and work hard to improve their personal records. This is what makes bowling a unique team sport – you’re not stuck on a particular team permanently. Many players have already had the option to move up to the varsity and junior varsity teams. Scores are improving and nearly everyone is breaking 100. Many bowlers have gotten three strikes in a row (called a turkey) and it’s only midseason. Everyone is supportive on the Olympia High School bowling team. There is a friendly vibe at practice as well as competitions. Several bowlers created encouraging cheers they often chant after someone gets a spare or a strike. High fives go around and the team captains work hard to make sure everyone feels included and supported. The team section at Westside Lanes is very spirited during practice. The sound of pins being knocked down is not the only thing heard inside the alley walls. Team members’ shouts and cheers create a fun and festive atmosphere. 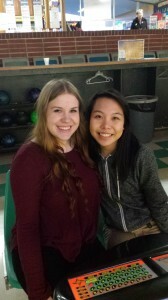 Kassidy Tromboni and Tina Pham watch team members bowl during practice and wait for their turn. The varsity and junior varsity teams consist of five students. 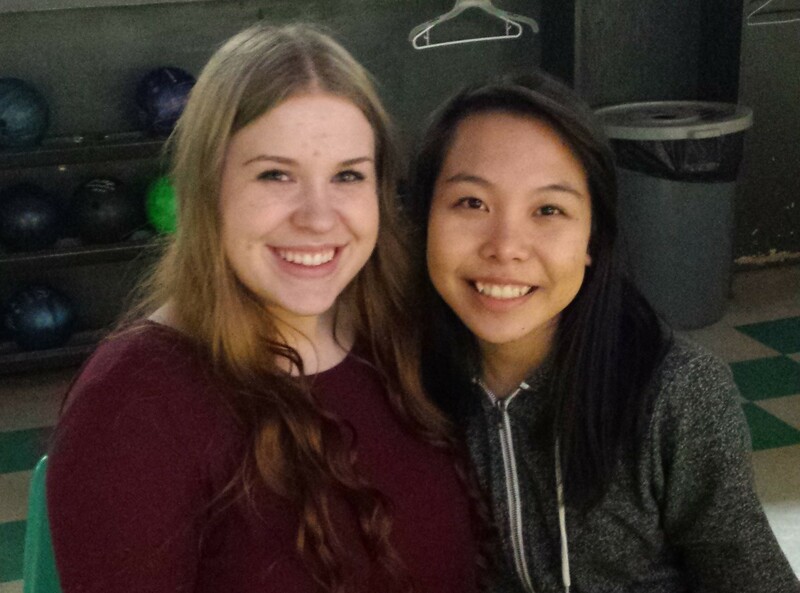 Jessie Jewell is the team’s number one varsity bowler. She has mastered the sport and can hook the ball well. The other members of the varsity team are Sam Nurmi, Laura Martinez, Justina Dizon, and Sophie Comas. They are all excellent bowlers who have, along with the rest of the team, been improving immensely. The OHS bowling team practices on Monday, Tuesday and Thursday if they don’t have meets and there is an optional practice on Friday. 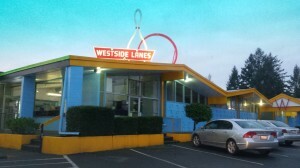 All practices are held at Westside Lanes. The team meets first in a room to break down the day. Then the bowling begins and it’s time to start practice. Olympia High School’s calculus and statistics teacher, Paul Rae, a bowler himself, is the team’s coach. Although it hasn’t been an overall successful season so far, Rae keeps the team motivated and is always encouraging them during practice and matches. When someone misses both pins on a 7-10 split, rolling the ball in between them, you can hear Rae jokingly say, “It’s good!” as if you’ve just gotten a field goal in football. The OHS Bowling team practices at Westside Lanes. In the coming years the OHS bowling team hopes to improve and grow. Many of the team’s members will be at Olympia again next year and plan to continue with the sport, aiming to come out on top. With both a good coach and supportive captains, it shouldn’t be hard.